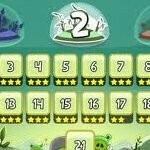 Although a whole set of new Windows Phone 7 users will be able to experience all the fun surrounding Angry Birds, those who currently play the game on another device and plan on switching to a WP7 smartphone in the near future will find one upcoming feature very appreciative. Angry Birds creator Rovio announced today through its Twitter account that they are planning to implement a game syncing feature that will run across all platforms that the game is available on. For the average person that sticks to one device, it might not matter as much, but for people who constantly switch devices, it’ll come to be a huge deal for them. Instead of having to start from the very first level if you switch to a different phone, the game syncing feature will keep your game state – so you can continue where you last left off. Naturally there are going to be some people excited about it, but there is no exact time frame given for its availability. They have announced this at MWC, I think. This is great! I like playing Angry Birds with my N8 due to the wider and more vivid screen and louder sound. I wouldn't mind continuing the game on my iPod touch once I run out of juice. I think that they already have this. When I got my Evo Shift, I downloaded the regular Angry Birds and saved it to SDcard. Then I changed my SDcard to a 4GB, I forgot that the game was on it, I had to re-download the game but my data was already there.